Gearing up to drive in Ireland? 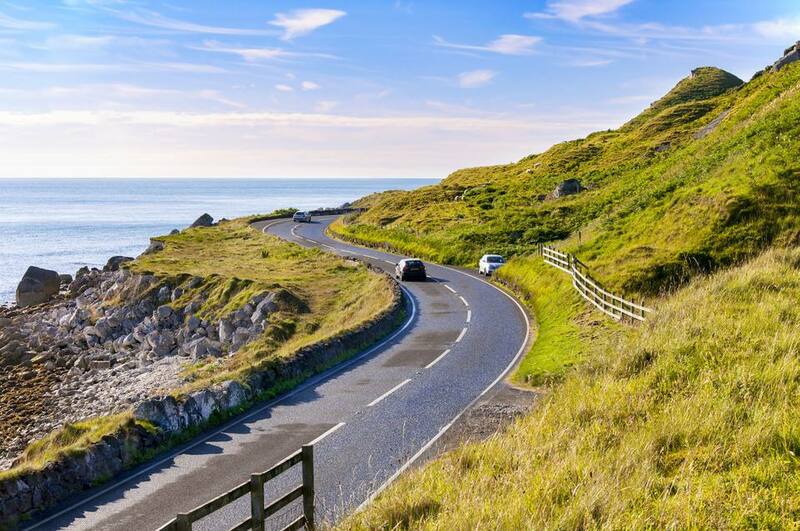 It might sound intimidating, but trust us: driving on the left will feel like second nature after a few days of cruising along the Wild Atlantic Way, puttering along rural roads dotted with castles or circling the roundabouts outside of Ireland’s charming villages. Follow this guide to prepare for everything you need to know about driving in Ireland — from driving on the left side of the street to navigating country roads. Learn about what documents you need to bring and what to do in case of emergency, plus the differences between driving in Northern Ireland and the Republic of Ireland. If you are a resident of the US, Canada or the European Union and you have a valid driver's license, then you will be able to drive in Ireland. Drivers from other countries will need to obtain an International Driver's License, but American licenses are automatically valid on the Emerald Isle. (Just check with the rental car company to see if they have any other restrictions, like a minimum age). In addition to a valid driver's license, you must also have third-party insurance (and credit card issued insurance does not count, unfortunately). Be sure that you know where your vehicle registration is, and carry a copy of your rental contract or a letter from the car's owner if the vehicle you will be driving in Ireland is not registered in your own name. The most important rule of the road in Ireland is: keep left. In the last 20 years, the roads in the Republic of Ireland have improved dramatically and there are many new, high-speed motorway options for covering long distances. However, Ireland is largely a rural country, and rural traffic is the norm. Expect large, and slow pieces of farm machinery around every corner from March to October. Also be prepared for wildlife and pets to suddenly cross the road, and know that you might come around a curve to find cows or (especially) sheep resting right in the middle of the pavement. Finally, remember that the traffic laws will differ slightly depending on if you are driving in the Republic of Ireland or in Northern Ireland, which are two different countries. Speed limits: In the Republic of Ireland, the speed limits are: 50 kph (30 mph) in urban areas; 80kph (50 mph) on single open roads; 100kph (60 mph) on national roads (marked by a green sign); and 120 kph (74.5 mph) on motorways. In Northern Ireland, the speed limits are: 50 kph (30 mph) in urban areas; 100 kph (60 mph) on single carriageways; 112 kph (70 mph) on dual carriageways. (Note: a single carriageway is a smaller road with one lane in each direction, whereas a dual carriageway has some kind of divider between the traffic going in opposite directions and usually has at least two lanes in each direction). Road signs: While warning signs in Northern Ireland are generally to international standards, those in the Republic of Ireland tend to be a bit old-fashioned. Don’t worry: most can be easily understood without problems. Direction signs are in blue for major routes (motorways), green for national roads, and white for local roads. Places of interest are signposted by brown in the Republic and black in Northern Ireland, both with white lettering. In Ireland, all place names will be listed in both Irish and English, and the distances are given in both kilometers and miles. In Northern Ireland, all signs are in English and use miles to communicate distances. Seat belts: Seat belts must be worn by the driver and all passengers at all times. Children under 36 pounds or shorter than 4'11" (150 cm) must use an appropriate car seat or booster seat. Cell phones: The use of cell phones while driving in Ireland is strictly forbidden. Bluetooth or handsfree devices are technically allowed but the Gardaí (police) warn that these devices are also distracting, and they will issue fines for any unsafe driving. Keep this in mind if you are planning to use your phone as a GPS for directions – and let a passenger be the navigator because the rule in Ireland is that the driver cannot touch a phone at all while operating a vehicle. Drinking and driving: Drinking and driving are taken very seriously in Ireland and few people will risk getting behind the wheel even after one drink. The legal limit to drive in Ireland is 0.5 milligrams of alcohol per milliliter of blood – which is lower than that 0.8 legal limit in many other countries. Toll roads: There are no toll roads in Northern Ireland, but they do exist in the Republic of Ireland and often cut down travel time significantly when compared to older, country roads. You will stop at toll booths to pay when entering toll roads in Ireland, with the important exception of the M50 around Dublin, which uses the eFlow Barrier System. You will pass through this system if you are traveling to or from Dublin Airport, but there are no physical toll booths. Your car's license plate will be photographed and you must remember to pay the toll online or at a designated kiosk before 8 p.m. the next day. Driving on the left side of the road: In Ireland, you must drive on the left side of the road. This means more than simply remembering to keep left. It means that everything you do as a driver in Ireland will feel like the mirror image of what you do without thinking when driving on the right. Remember that the more important side-view mirror is on your right and the interior rearview mirror on your left. If at all possible, drive a few minutes in the rental company's parking lot before getting on the road, just to get used to the driving-backward feeling. Driving on the left side of the road may feel surprisingly obvious when everybody else is doing it, but drivers who are used to keeping right tend to forget and let old habits take over, especially after breaks, on lonely roads, and in the morning. Whenever you come to a stop or need to turn, take a moment to remind yourself to stay to the left. Driving on the left means that you will always pass traffic islands to the left, and drive through a roundabout in a clockwise direction. You must make a left turn when accessing a motorway (which is the Irish term for a major highway) and remember to join traffic on your right side. Some people find that it actually helps to have a small post-it note saying "stay left" on the dashboard. Right of way: At unmarked crossings, the car from the right will have right of way, and the same goes for cars already in a roundabout. In the Republic, yellow signs with black markings give instructions at marked crossings, with a graphic approximation of the layout with thick lines denoting the right of way, thinner lines representing roads that have to yield. On rural roads, which tend to be very narrow, it is best to let large cars and buses have the right of way just to be safe - unless they are clearly stopping to yield to you. Gas stations: Expect most gas stations (called “petrol stations” in Ireland) to be smaller than the standard gas-and-convenience-store option in North America. Gas stations can be few and far between in rural areas, and almost none of them offer 24/7-service. It is a good idea to refill once your tank is half empty. Remember that not all gas stations will take credit cards, so you should have plenty of cash. That means euros in the Republic of Ireland and pounds in Northern Ireland. As you go to fill the tank, make sure you double check what kind of gas the car needs and what kind of gas the pumps offer. Whereas at many U.S. gas stations the pump handles for diesel are green, a green handle means unleaded petrol in Ireland. Always read the label to be sure. And if you make the mistake of filling up with the wrong fuel, do not start the car; push it to the side and contact your car rental company immediately. They'll put you into contact with a mobile tank-cleaner which is costly, but cheaper than losing the engine. In case of emergency: If you need to reach emergency services in Ireland for any reason, 112 and 999 will both connect you to the emergency operator regardless of if you are in the Republic of Ireland or Northern Ireland. Most private cars, as well as most rental cars, in Ireland are stick shift. This means that in addition to getting used to driving on the left side of the road, you will also need to familiarize yourself with a car that feels like the mirror image of the one you might be more used to driving on the right. Deciding between automatic vs. stick shift driving in Ireland is about more than knowing how to operate a manual transmission vehicle on the right side of the road because the gear shift will also be in a different place. In Ireland, you will change gears with your left hand, which takes some getting used to – particularly when you are right-handed. If you are not comfortable driving stick shift (or do not want to worry about re-learning on the left), then be sure to reserve your rental car as far in advance as possible before the automatic cars sell out. Should You Rent a Car in Ireland? Ireland has a bus system that connects most major and mid-sized towns, but renting a car is the best way to see the Irish countryside. However, you do not need a car if you only plan to stay in Dublin. In Dublin, parking spaces are at a premium, the traffic is slower than in New York City, and nearly all sights are within walking distance of each other. Choose the location of your accommodation wisely so walking is possible and use public transportation or a cab for destinations that are not within walking distance. There should be no reason to use a car in Dublin or in many other Irish cities, for that matter. Get to Know Ireland, From A to Z, Literally!